Brazilian jazz is one of the most popular subgenres of jazz for fans and performers alike. With infectious grooves, hard-driving solos, and strong ensemble interaction, Brazilian jazz is enjoyable to listen to and exciting to perform. While you may listen to Brazilian jazz, you may not know how to create that same cool sound in your playing. This article helps you do just that, take Brazilian jazz sounds from your favorite albums and put them onto the guitar. In this lesson, you’ll learn seven essential Brazilian jazz licks, as well as study these lines in action over the tune Solar. By studying this material, you increase your knowledge of Brazilian jazz soloing, as well as increase your jazz soloing vocabulary at the same time. Many of the licks on this page are in the style of Brazilian acoustic guitar player Baden Powell because he is one of the key figures in the Brazilian Jazz movement. Baden Powell was born in 1937 and named after the founder of the boy scouts, Robert Thompson Baden Powell of whom his father (a violin player) was a big admirer. He started playing guitar at the age of 8 and proved to be a prodigy on the guitar. He performed in the program Papel Carbono and won the first place as guitar soloist. At the age of 13 he was playing as a professional musician and got inspired by jazz music. In 1956 he got his first big success: Samba Triste. Another well-known composition of him is Berimbai. Baden Powell had complete command over his instrument and coupled this with unique musicality. He died in 2000 at the age of 63. This first lick outlines a minor ii V I chord progression and is played in the style of Baden Powell. This lick uses three different scales, one over each chord, which is a typical approach to minor 2-5-1s in a jazz setting. These scales are the E Aeolian mode, E harmonic minor, and E melodic minor. As well, there’s a triplet rhythm throughout the lick, a rhythm that Baden loved to use in his guitar solos. After learning this lick, improvise with these scales over minor ii V I chord progressions, as well as with triplets, to take these concepts further in your studies. Here is a variation of this Baden Powell lick, this time over a major ii V I chord progression. Watch that you don’t rush during the triplet section, which is a common roadblock with repeated rhythms, and as always use a metronome to get the rhythms accurate and even in your studies. To continue your study of Baden Powell’s soloing concepts, here is a typical arpeggio line in the key of E major. Notice the slides in the last section of the lick, as these are characteristic of Baden’s playing, and of Brazilian guitar in general. This Baden Powell chord phrase uses up-beat attacks along with three and four-note voicings to outline a ii V I in F major. If you are new to chord soloing, try plucking each chord with your fingers, or you can use a hybrid (pick-fingers) picking approach in order to get that Brazilian feel in the tone of the phrase. Here, you will learn a highly syncopated line that uses three-note chord fingerings over a common chord progression. Go slow with this phrase and use a metronome in order to get each upbeat chord accurately placed within the measure. Try not to rush which is a common issue many players experience with this type of phrase. This next lick is a short ii-V-I-vi phrase that uses a typical Baden Powell approach to arpeggios. Here, you will play an upper melody note at the start of each chord, followed by an ascending three-note arpeggio that outlines the underlying chord change in the phrase. Coming from the classical realm, this type of arpeggio pattern can add a nice Bossa feel to your improvised lines and phrases in any setting. In this lick, you mix a Brazilian feel with traditional bebop technique to create a true Brazilian jazz melody. Bar 1 features a typical Choro pattern, which is a style of Brazilian traditional music. In bars 2 and 3 you find a classic bebop lick over a dominant 7b9 chord that many jazz musicians use in their playing. Using a b9 over dominant chords adds tension to your lines, which is essential when soloing over 7th chords in a jazz situation. The final Brazilian jazz phrase uses a cycle of dominant substitution over a ii V I in D major. This line is typical of Brazilian musician Hermeto Pascoal’s playing and writing and can be heard in his song Chorinho Pra Ele. Though the chords are Em7-A7-Dmaj7, you play C7-F7-Bb7-A7-Dmaj7 over those chords. This creates a tension and release-sound in the line, one that is reflective of both the jazz and Brazilian improvisational style. After you’ve learned this lick, take these subs to other musical situations as you expand on them in your playing. Now that you’ve worked these Brazilian jazz licks on their own, you can bring them together in a soloing study. 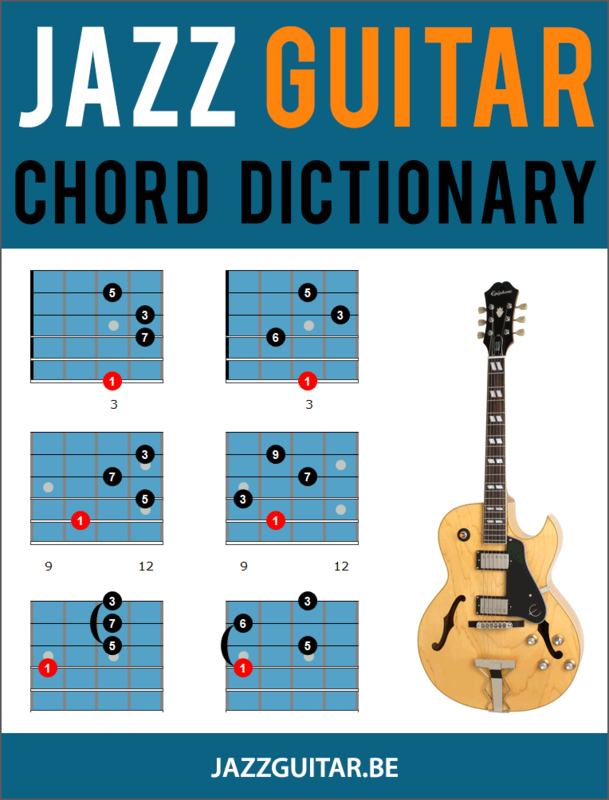 In this study, you’ll learn a solo over the chord changes to the Miles Davis tune Solar. One of the great things about Brazilian jazz is that you play both Brazilian tunes and jazz tunes in a Brazilian style. This is an example of these licks in action, as well as a jazz standard played in a Brazilian style. Its nice to see this kind of material here! If your in brazzilian music, special,y Baden, dont forget to check his work with the poet Vinicius de Moraes, “os afro sambas”. Thats consider an distinctive work in Baden’s career. If jazzguitar.be could talk a bit about the distinctive harmonies and sonorities of that album, it would be GREAT, because i cant find it on the web. Cheers!!!! Great to see and hear the incredible Hermeto Pascoal performing on piano with these younger players! Hermeto Pascoal for those not familiar with his music was a major proponent of spreading Brazilian styles throughout the world. He was also responsible for mixing traditional with other styles to create a fusion of sorts with his own ensembles as well as being musical director and accompanying singers and instrumentalists such as Flora Purim, Airto Moreira etc. He was on Miles Davis’ Live Evil recording in 1971(?) where he was featured on 3 pieces which were his own compositions. That helped him gain much deserved recognition. A great composer, arranger, and improviser. Thanks for delving into this Brazilian style. Great stuff which isn’t covered nearly enough imho. WOW! IT IS NICE TO SEE THIS KIND OF MIX LICKS USING DIFFERENT SCALE OVER 2 5 1 JAZZ PROGRESSION. IT REALLY AWESOME STUFF! EVER FOR ANY JAZZ GUITARIST.THANK YOU VERY MUCH. MAY GOD GRANT YOUR WORK.